Since Chinese New Year is still around (it’s roughly three weeks long) and my parents insist upon having a family dinner out, we ended up agreeing to eat at Sakamai. 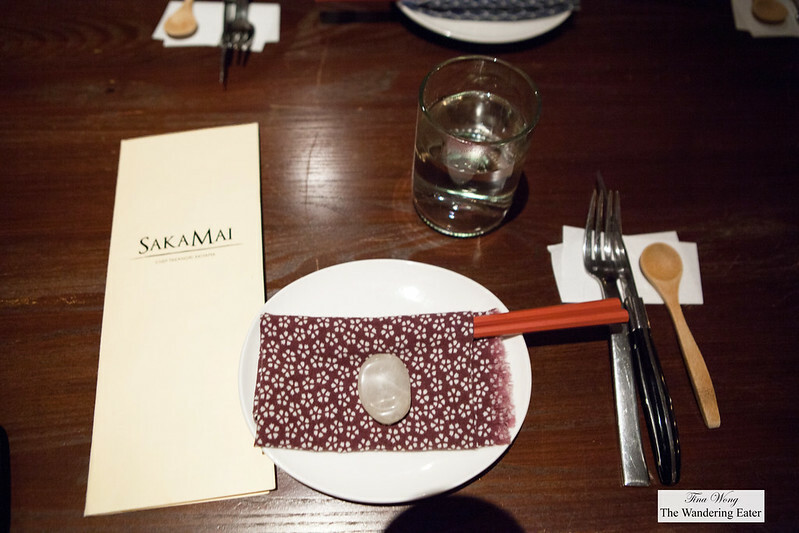 As a family, we like Japanese food but what appeals to us the most about Sakamai is the creative dishes served for an izakaya (a casual sake pub, so to speak). The menu has a few luxurious ingredients like uni (sea urchin) and foie gras dabbled with the likes of other ingredients like tuna or scrambled eggs. 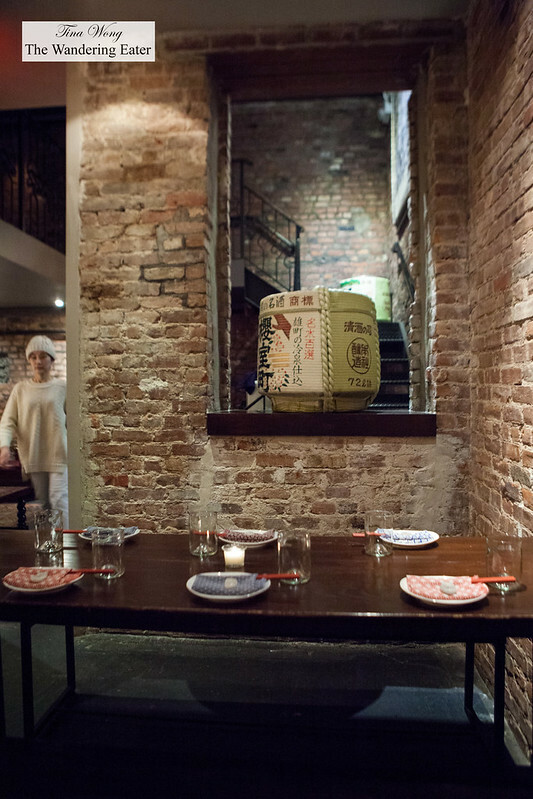 It is not your average drinking fare as this is more of a thoughtful, maybe a bit more serious food that you would have with your sake or any other alcoholic beverage. 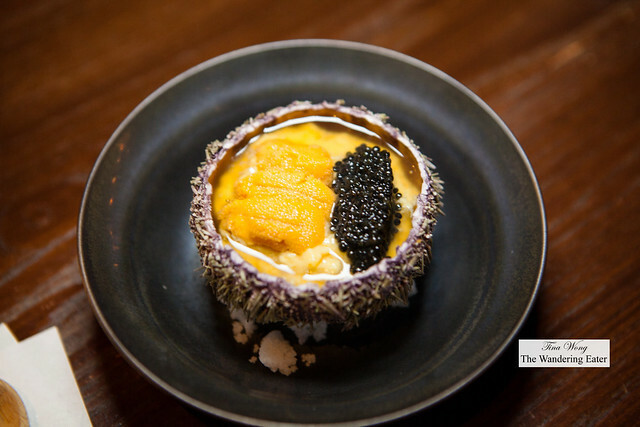 The restaurant’s popular dish, Egg on Egg on Egg ($18) is sturdy yet soft scrambled eggs topped with sturgeon caviar and three tongues of uni set in the uni’s own shell. (The dish’s name is cute but technically the part of the uni we eat is its gonads.) At any rate, this was a stunningly beautiful and luxuriously tasty dish. Silky, a touch salty, nutty, brininess from the caviar and the sweetness of the uni made it sublime. 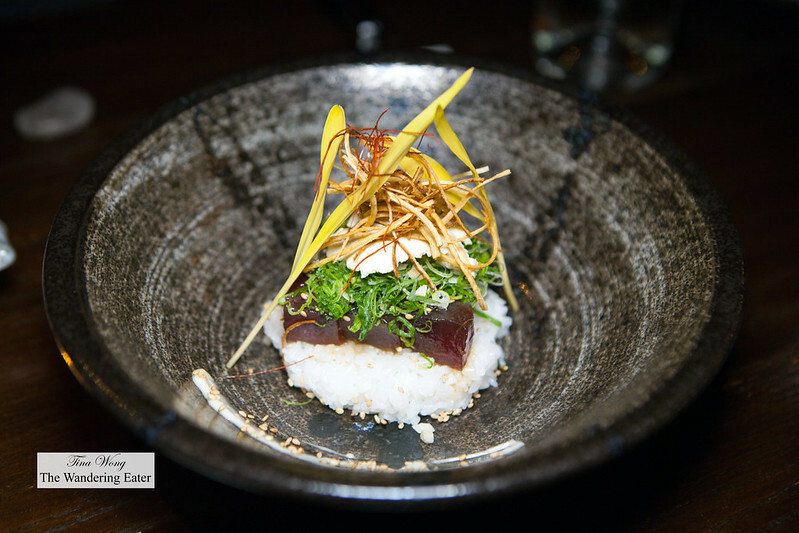 The ahi poke ($18) a stack of marinated tuna, topped with foie gras custard, smoked aioli, crispy burdock root set on a bed of sushi rice was fantastic. The rice was perfectly cooked, not too wet and a little bit sticky (as it should). 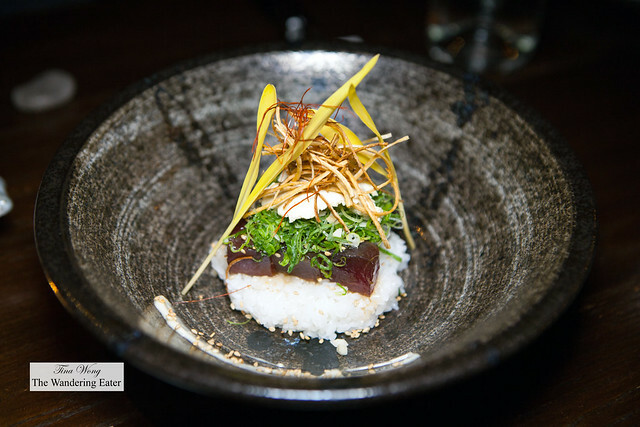 The varying textures of silky and crispy was balanced and the smoked aioli gave the dish a haunting note that makes you want to keep eating. 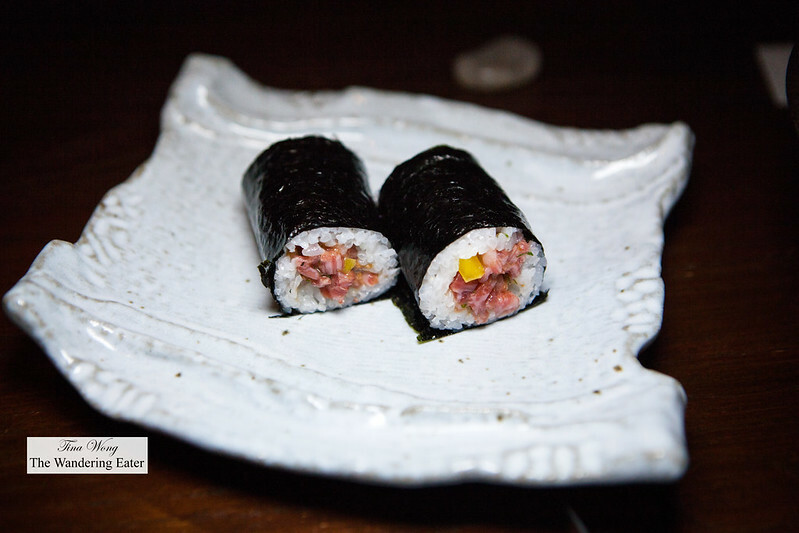 The wagyu and uni sushi hand roll ($14) is a tasty maki roll but the sushi rice was a bit too wet. 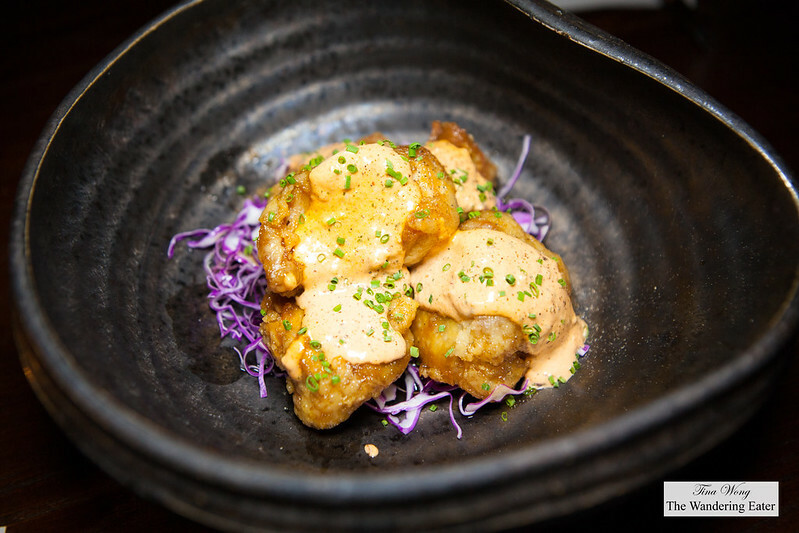 Chicken nanban, a bowl of fried chicken confit topped with smoked paprika tartar sauce was an explosion of flavors. The super tender, flavorful chicken that was slow cooked in its own fat topped and deep fried, then topped with a smoky, slightly briny, creamy sauce made it divine. 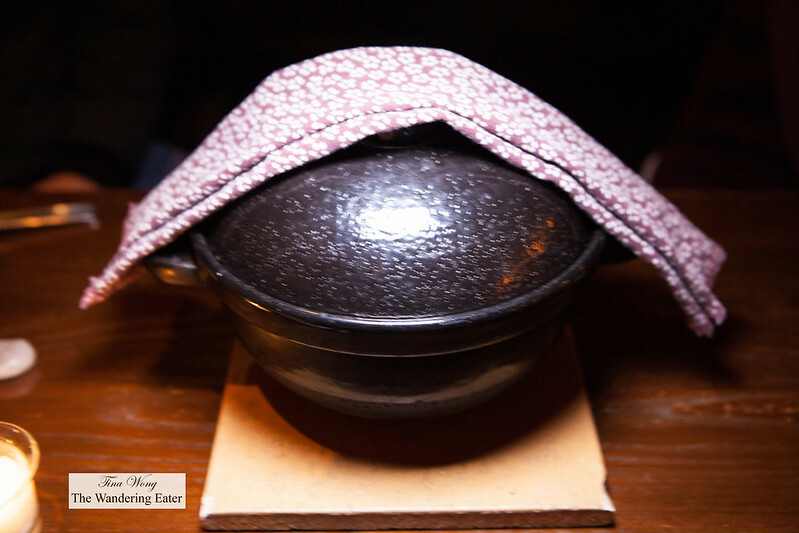 We would order more bowls of these next time, when we do eat here again. 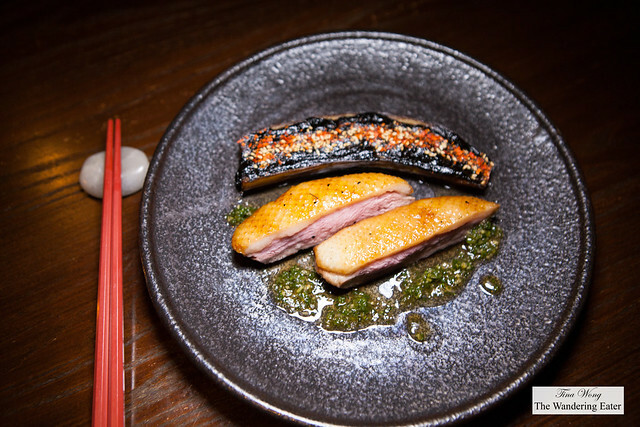 The two thick slices of tender duck breast sauced with a spicy yuzu kosho scallion soy sauce and a thin slice of black garlic-miso eggplant. The duck was delicious as the fattiness was cut with the spicy sauce. The eggplant almost stole the show from this dish, as we were fascinated by the robust, thick, fermented, black bean flavored sauce (even though there’s miso glazed on this) with the sprinkling of dried chili pepper flakes on top. 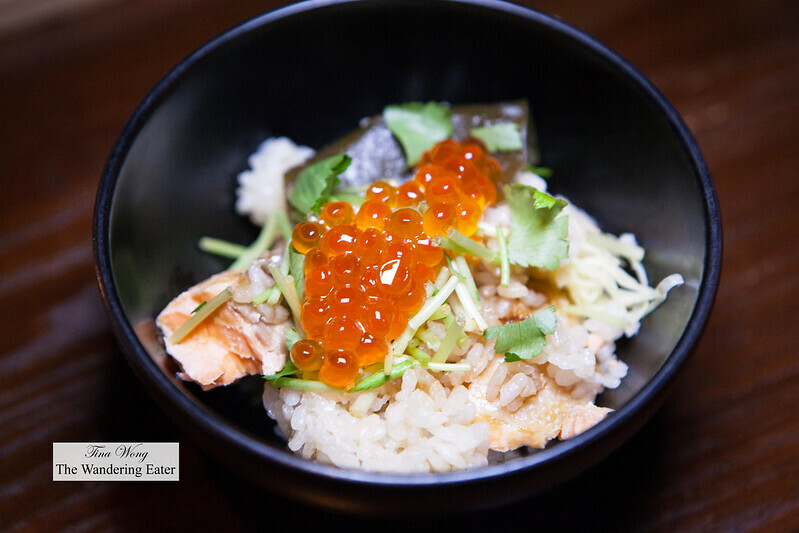 We shared a large pot of ocean trout Uonuma Koshihikari rice pot ($37). This comforting clay pot of rice was perfect for a chilly winter’s night. 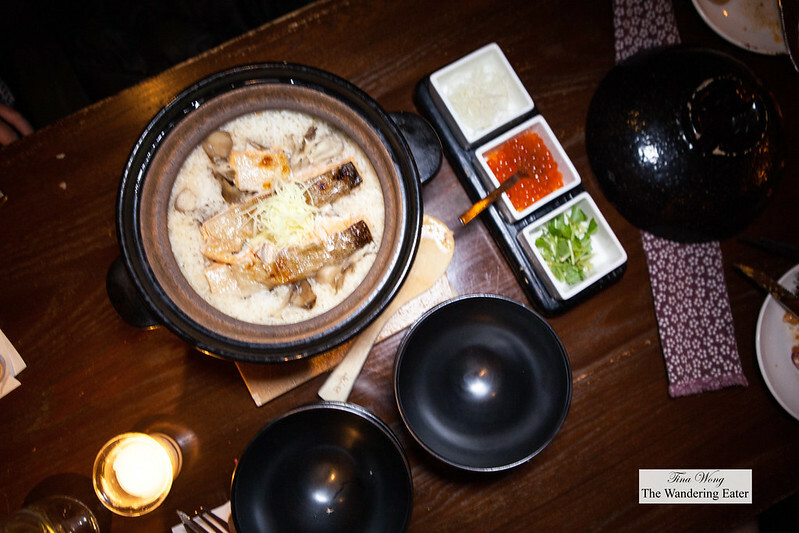 The rice is harvested in Japan’s mountainous snow country, famed for the purity of its water, and steamed in a handmade double-lidded donabe pot. 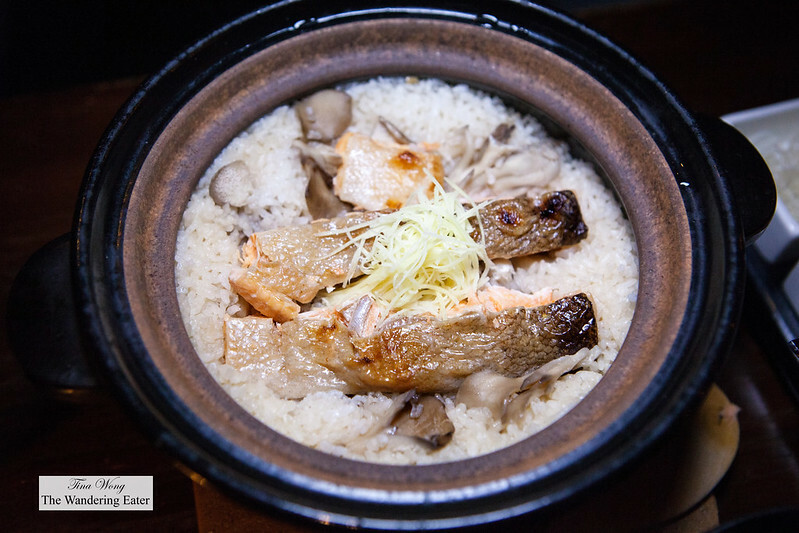 The slices of filleted ocean trout was cooked perfectly and delicately spiced with the wispy thin slices of fresh ginger and various wild mushrooms. We would come back here again for the solidly good food and a few of the dishes were excellent. The space is a comfortable mix between sleek and rustic. The large wooden communal tables in the back works served us well since my family likes to spread out. The staff was friendly and knowledgeable about the food.